Find out where you can enjoy poke in Hawaii and more here. Where can you find poke in Hawaii? Why is poke so popular today? How can you make poke at home? Poke is pronounced as a two syllable word. So unless you won’t mind strange looks from locals, don’t pronounce as a one syllable word in Hawaii. In Hawaiian, poke means to section or cut-off. Poke is a traditional Hawaiian seafood dish. Supposedly, the dish was started as a snack by tuna fishermen in Hawaii. They cubed the lesser quality parts of the fish, marinated them in a sauce, added some sea salt and garnished them with onions. People often principally make poke with chunks of raw tuna. But some also use other types of seafood as the main ingredient. Examples include: raw crab, octopus or salmon. In the past, many people in Hawaii just ate poke by itself, as an appetizer or as a side dish with other types of Hawaiian foods. It was something many people ate with friends at the beach while drinking beer. Today, you can find poke even served as a main dish in the form of poke bowls. This is where you can get poke served over a bowl of rice. 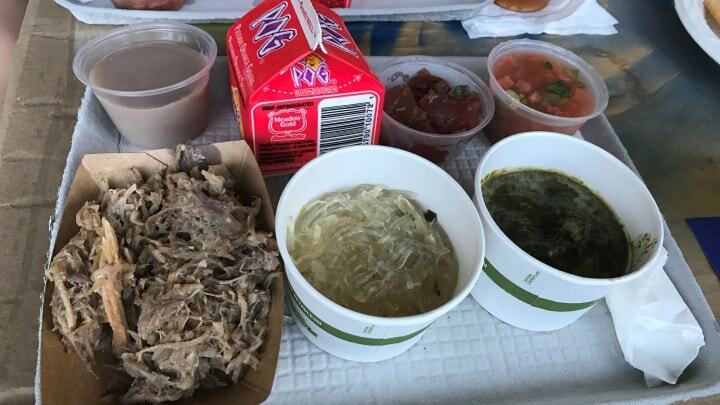 In Hawaii, you can find poke served at most major supermarkets, fish markets, Hawaiian food restaurants, mom and pop outlets, farmers’ markets and specialty stores. You can even find poke at Costco in Hawaii. Here are some of the more notable places for poke in Hawaii. You definitely need to try some on your next trip to Hawaii. You can get old style classic poke at Alicia’s Market in Kalihi and Tanioka’s Seafoods & Catering in Waipahu on Oahu. On the Big Island, you can sample poke at Umeke’s in Kona as well as at Suisan in Hilo. Try genuine local style poke at Tamura’s Fine Wine & Liquors in Kahului or at Eskimo Candy Seafood Market & Cafe in Kihei on Maui. On Kauai, you can try solid poke offerings at Pono Market in Kapaa and Ishihara Market in Waimea. Poke (second item, top right) is a typical dish whenever Hawaiian food is served. There are many potential reasons why poke is so popular today. Here’s our take on this subject. In Hawaii poke has always been popular. It’s what people ate whenever there was a festive occasions, such as parties or weddings. It has been the pupu (Hawaiian for appetizer) of choice for generations. This has been especially true whenever you want to have something to eat while chewing the fat with your buddies over beers. But poke’s fame has now extended beyond Hawaii’s shores. Today, you can find poke being served in a wide range of places on the US mainland as well as in Japan. Perhaps poke may be riding off the popularity of sushi. After all, they do often share the same basic ingredient, which is raw fish typically in the form of tuna. This could also be why poke is increasingly in vogue in Japan. Another factor in poke’s buzz outside the Aloha State is that food from Hawaii is becoming very chic. In fact, many things from Hawaii are also chic. So why not poke? You can definitely make poke at home. Furthermore, you can get almost all of the necessary ingredients at your local supermarket. Start off with getting some good raw fish. Tuna is always a good choice. Cut the tuna into bit-sized, square-shaped chunks. Place them in a bowl. Create a marinade of soy sauce, chilies and sesame seeds. Also add pinches of sea salt to taste. 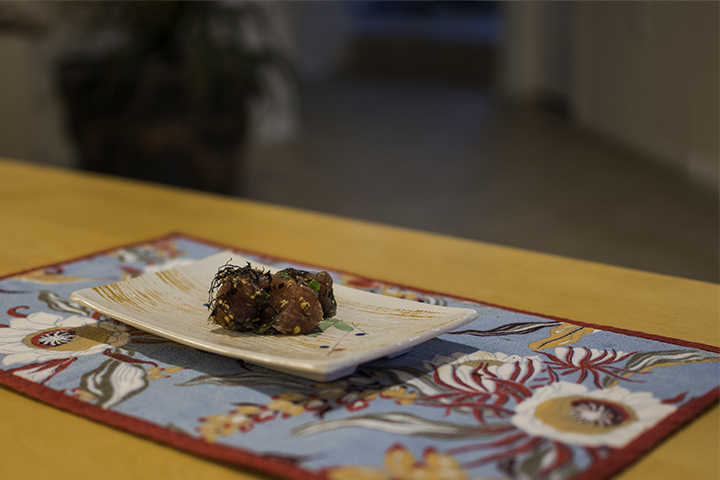 If you can get them, add the secret ingredients to the marinade: inamona (the roasted chopped-up meat of the kukui nut or candlenut tree) and ogo limu (Hawaiian seaweed). You can buy this online in dehydrated form online. It’s called Poke Mix and made by a company called Noh. If you can’t, then substitute this with sesame oil. Then finish it off by adding slices of sweet round onions and/or chopped scallion as garnish. Add the marinade and toss them in the bowl to coat the tuna. And voila, you’re ready to enjoy homemade poke. 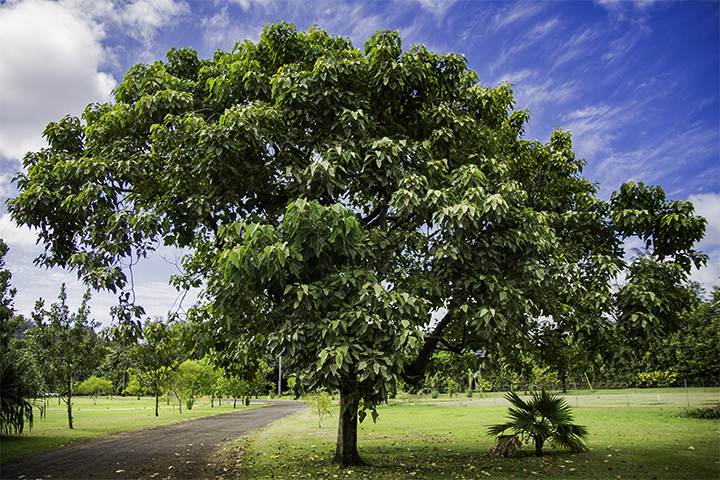 The kukui nut tree provides one of the two secret ingredient to poke in Hawaii, inamona.